Dr. Ventura is a graduate of the University of Texas Medical School. He completed his Surgical residency and Urology residency training at the University of Cincinnati. He is board certified in Urology. 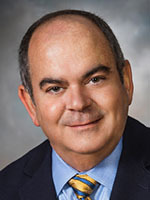 He is a Fellow of the American College of Surgeons, and is member of the American Urologic Association and American Association of Clinical Urology.